Part two of an investigation into achieving balance in spirits-driven cocktails. Back in March I wrote about trying to improve a spiritous cocktail I had created (Criollo #2) which on reconsideration, I felt turned too sweet. The concept started out as a kind of ‘Black Manhattan’ with amaro taking the place of vermouth but I discovered that as I added more amaro I was also increasing the amount of sugar. That in turn led me to think a lot about the options we have for bringing acidity to a cocktail. It’s acid which helps brighten and highlight all the other flavors. However, without citrus as an option, we’re at a distinct disadvantage. I focused on the properties of vermouth, which I described as a kind of super-ingredient, bringing not only needed acidity into a cocktail but also many other interesting and complex flavors. I decided at that point to “do some serious science” by which I meant to I wanted to measure the PH of common cocktail ingredients to determine exactly how acidic. or not, they were. A double junction probe (generally considered longer lasting—the probes are filled with reference material that can dry out over time). Support for three calibration points. I also checked with the manufacturer to determine if it was suitable for taking measurements in alcoholic solutions in excess of 50% (100-proof). It was! Finally, I purchased a set of reference buffer solutions, critical for calibration which must be done before every use. Should you buy a meter of your own, it’s important to note how many and which calibration points are supported. The buffer solutions you buy must match these calibration points. There are in fact two slightly different calibration systems: one called “US” based on the points 4.01, 7, and 10.01 and one called “NIST” based on the points 4.01, 6.86, 9.18). The Oakton meter supports both. 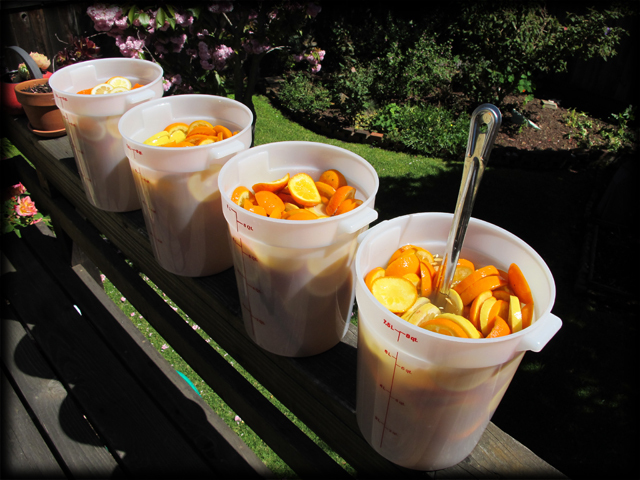 To date I have tested over 65 cocktail ingredients, including aromatic bitters, syrups, and common citrus juices. The results are summarized in the table below. (NOTE: you can click on the image to download an easier to read version of the table in PDF.) As a reminder for non-science geeks, PH 7.0 is considered neutral, neither acidic nor basic. As PH goes down from 7.0, acidity increases; as PH goes up from 7.0, alkalinity (or basic nature) goes up. Tap water is generally about PH 7.0, though as it gets “harder” (includes more dissolved salt and minerals) the PH value increases. 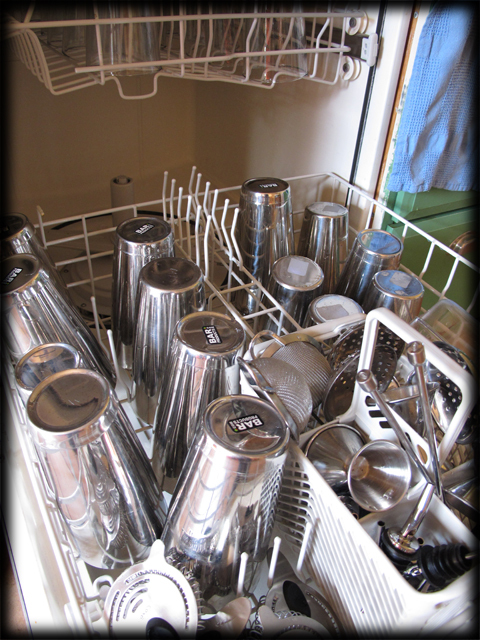 A lot of tap water is slightly basic. You’ll notice that with only a single exception (discussed below) common cocktail ingredients range from neutral (e.g. gins and sugar syrups) to distinctly acidic (e.g. citrus juices). The most acidic ingredients are, unsurprisingly, lemon and lime juices which measure below PH 3.0. These then set the “gold standard” for bringing acid into a cocktail. A relatively small amount of these juices can be used balance against a large amount of sugar. All other ingredients are distributed between PH 7.0 (neutral) and PH 3.0 (moderately acidic). If we consider them by class, some interesting patterns emerge. Second, distilled spirits which start life or are sold at high proof (i.e. are highly distilled) and which spend no time in wood are pretty much neutral. This covers gin, vodka, “white dog,” and products like Everclear. Any acidity that may have existed in the source material prior to distillation has been eliminated. Contrast these pisco, which is made from grapes, distilled only once, and spends no time in wood. PH for the two piscos I tested were 4.1 (Encanto) and 3.8 (Oro), distinctly more acidic than gin or GNS. Also consider the case of Ransom Old Tom gin, which has a PH of 4.3. The Ransom is allowed to rest in used pinot noir barrels, long enough to develop its distinctive color. It also apparently absorbs some acids left behind by the wine. You’ll also see that spirits which are aged in wood appear to develop acidity over time. I am hesitant to draw too much of a conclusion about this phenomena since my data set is limited in this respect and there are so many variables when it comes to barrel aging: e.g. type of oak, amount of char, new vs. used, temperature/humidity during aging, previous contents of barrel, etc. Still, it is interesting to note that the most acidic distillates, the 23 year old Black Maple Hill rye and the 18 year old GlenDronach, are also the oldest spirits I had available for testing. Another interesting ingredient to look at is the liqueur St. Germain. 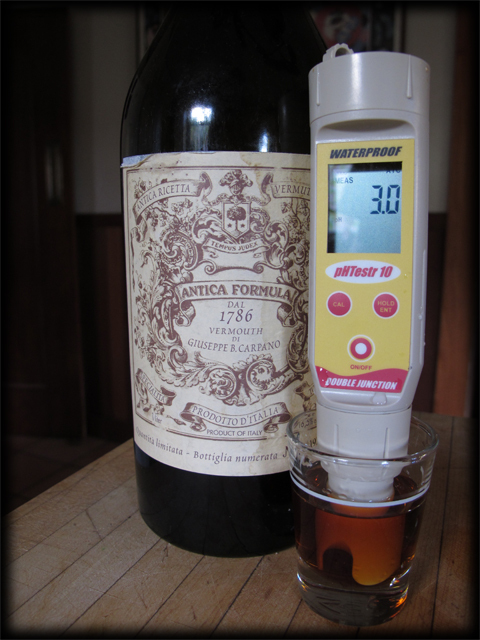 which is almost as acidic as some of the red vermouths. Compare that Cointreau, which is practically neutral. This explains, to me at least, why it’s been such a successful product, meriting the sobriquet “bartender’s ketchup.” While it brings lots of sugar, it’s also pretty well balanced in itself. Adding it, even in large amounts, to a cocktail isn’t likely to upset things very much. 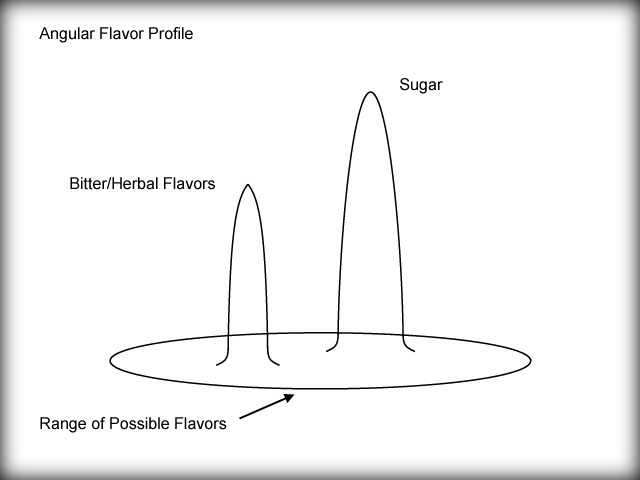 One last observation: there was only one ingredient which measured distinctly basic (high PH). That was the Rothman & Winter creme de violette. This was so unexpected that I measured it twice on two different days just to be sure I hadn’t made a mistake. I am speculating this is caused by whatever has been used to color this product, which is a rather deep violet. I am hoping that the folks at Haus Alpenz will be able to answer this for me at some point (and I will certainly post an update if I learn anything). I will continue to test the PH of new ingredients and update my database. Let me know if you’d like a copy. I am also going to be talking to distillers, to see what they have to say about some of my observations, particularly regarding acidity derived from barrel aging. I’d like to understand what’s going on there better. Are significant acidic compounds present in the wood, which then dissolve in the distillate? Do barrels which have previously held wine or sherry cause distillates then stored in them to become more acidic than otherwise? 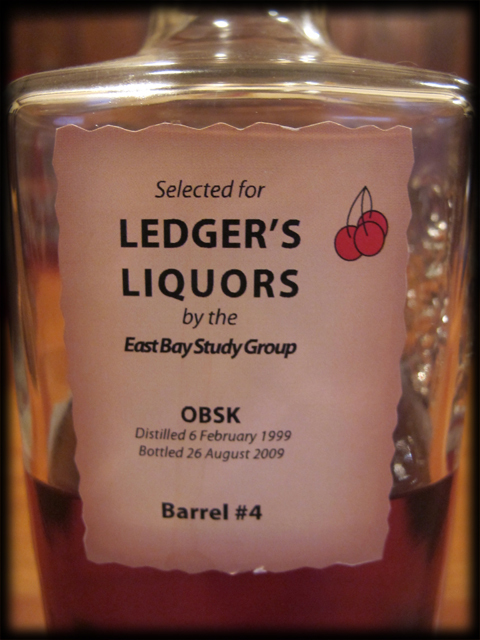 Just a quick follow up to my posting about selecting barrels of bourbon with the East Bay Study Group back in March. The bottled bourbon has arrived at Ledger’s at last. The group’s first place selection is available as Barrel #8. As the barrel was a relatively low fill you can expect this one to sell out pretty quickly. The second place selection is available as Barrel #9. There’s a lot more of this as the barrel had a surprisingly high fill. (We had expected both to be on the low side.) Both bottles are very reasonably priced at about $25 each. One thing worth pointing out is that technically these are NOT McKenna bourbons in as much as the barrels we selected don’t necessarily conform to Heaven Hill’s own profile for that product. Heaven Hill has chosen to make the McKenna label available for this particular barrel purchase program (a huge expedience) but was willing to provide a relatively wide range of samples to us try. This is worth keeping in mind whenever you are evaluating a privately purchased and bottled barrel of whiskey. Not all programs are equally flexible (i.e. some programs only offer barrel samples which are more or less “on profile” for the label) but in the case of Heaven Hill and McKenna, we are afforded a great opportunity. If you count yourself as a serious whisk(e)y drinker living in the greater San Francisco Bay area, it is likely that at some point or another you’ve made your way to Ledger’s Liquors on University Avenue in Berkeley. Unlike J. Walker or Cask, this old-school looking store (one of the oldest in California, actually) serves the needs of a highly varied clientele. At the register you’re just as likely to find people buying expensive single malts as someone from the neighborhood picking up smokes, a six-pack, and some lottery tickets. And yes, the inventory is that varied. If you’re something of a regular at Ledger’s then you’ve undoubtedly also made the acquaintance of Mr. Ledger, AKA Ed, who’s almost always on hand. 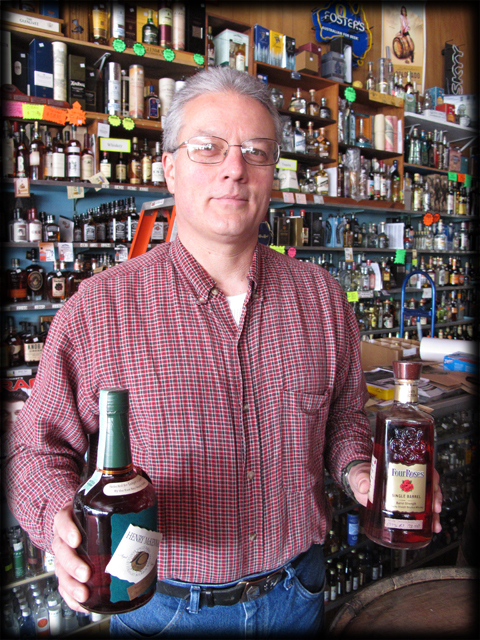 It’s Ed’s passion for spirits and craft beers which keep the store shelves literally overflowing with treasures, some you won’t find elsewhere. Mention the name of a vermouth or a gin Ed’s not heard of and he’ll more than likely write it down on one of his “lists” and bring it into the store. And if the subject of bourbon or rye is brought up (easy enough to do) and, if your timing is just right, Ed’s very likely to steer you toward one of his private single barrel bottlings. While barrel purchases have now become somewhat common place, Ed and others like him started doing this when many distilleries had stocks of older whiskeys just “laying about” and which they were more than happy to sell off to anyone showing some interest. Several legendary bottlings emerged from that period, most notably the very old ryes purchased from Kentucky Bourbon Distillers and sold variously as Black Maple Hill, Vintage, LeNell’s Red Hook, and Willet. Those days are for the most part behind us. Old rye stocks are more or less gone and old bourbons, when you can find them, have become expensive rarities. Today, it’s more typical for bars and liquor stores to be offered the chance to buy a barrel of regular product (e.g. Sazerac rye) which may or may not represent anything out of the ordinary. It can, depending on the distillery, be more or less just a marketing gimmick. Even when you are offered several barrel samples from which to choose (and sometimes you are not—demand being what it is for some products, it can be a “take it or leave it” deal), none of them may be particularly more (or less) exciting than the standard bottling. 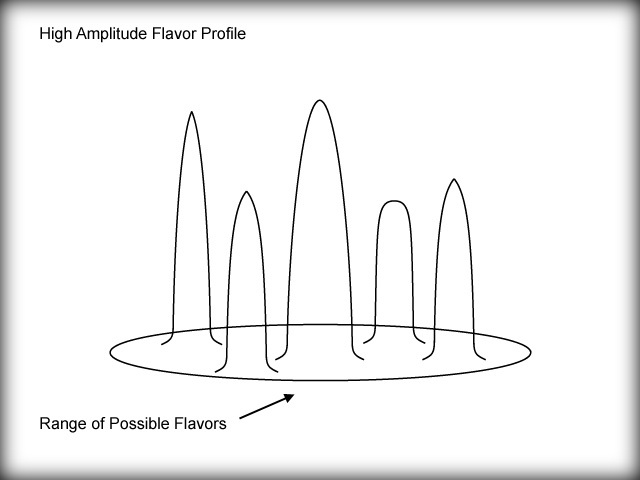 This is in part a function of flavor profiling, meaning the distillery may not want to release any product that varies too far from a brand’s established taste. 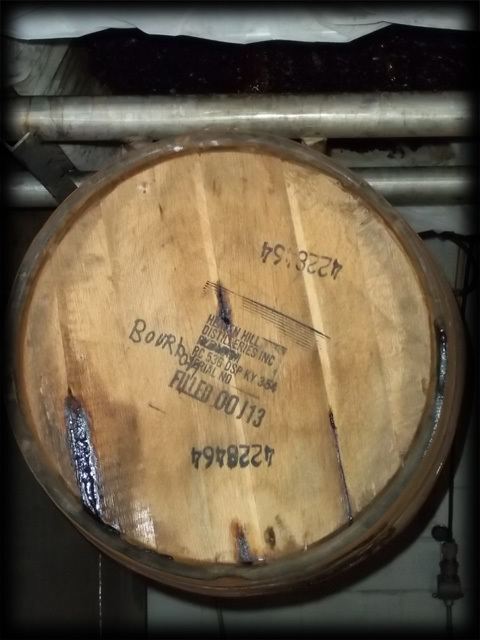 (And note that blending and/or carefully selecting barrels as they mature is one way this is accomplished.) I suspect it may also be a function of what I will call laziness: the distillery may prepare all of the barrel samples from the same easy to get to spots in the warehouse. Barrels which have spent their lives aging next to each other (AKA “sister barrels”) are very likely to be similar in taste. Still, it is possible to obtain an extraordinary product through a barrel program. For starters, it helps if you are working with a smaller distillery (though not all have sufficient inventory to offer barrel purchases) or with a distillery willing to offer off-profile barrels. Second, it helps if you have contacts who work at the distillery with whom you can communicate directly. (Are you on a first name basis with Parker Beam or Harlan Wheatly? You’re ahead of the game!) Finally, it helps if you are perseverant, patient, and willing to taste through as wide a variety of samples as you can obtain, not just from the first set you are given. 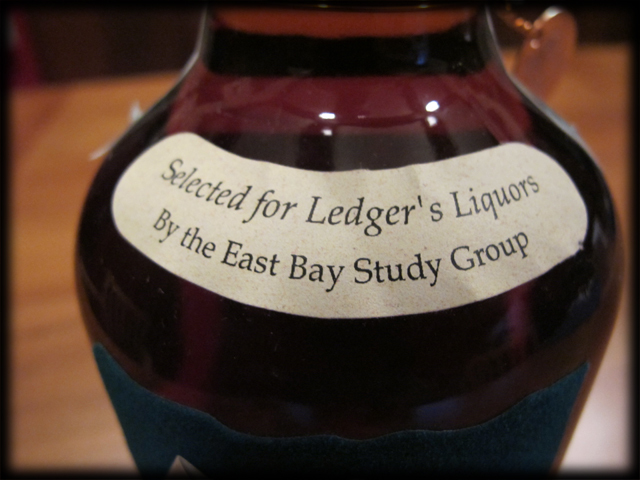 Selected for Ledger’s Liquors by the East Bay Study Group. Whom, you may then ask, is this mysterious (and generic sounding) East Bay Study Group? Over the course of about a year, in various conversations with Ed, I learned bits and pieces about the group. There are about half a dozen to eight people in the group, including Ed. Most but not all live in the east bay. There is no regular meeting time. Some of the members have worked “in the business” but most are just amateurs who’ve given themselves a serious education in distilling, warehousing, and blending of barrel aged spirits. There are members who have committed to memory the detailed history of all the major distilleries in Kentucky or who have tracked down vintage bottles of bourbon from the 50’s, 60’s and 70’s so they can compare them to modern product. Another member can identify where a whiskey was distilled and aged by reading the Distilled Sprits Producer (DSP) numbers off the end of the barrel. Other have great palate memories. 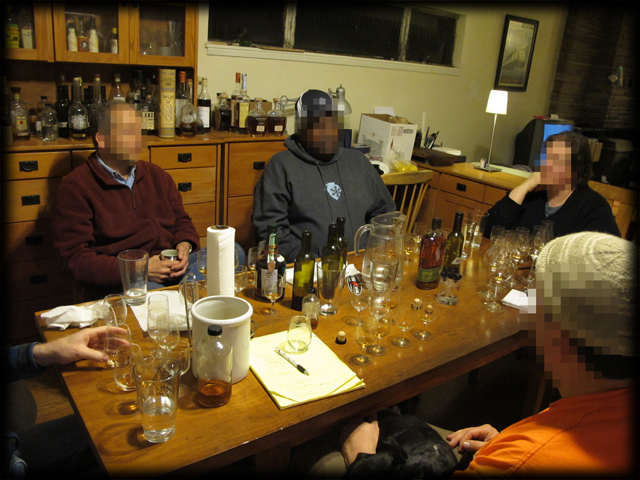 Yes, the East Bay Study Group are whiskey geeks of the highest order. And they do like to drink. A few months ago Ed introduced me to one of the group members who had come by the store to pick up bottles from a recent barrel purchase. After chatting him up for a while and exchanging some emails, I was asked if I’d like to participate in some upcoming tastings. I didn’t need to be asked twice! 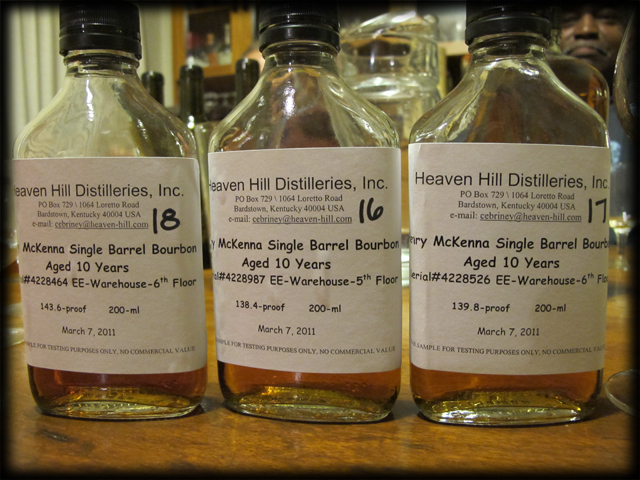 A few weeks later I got to take part in the evaluation of barrel samples from Heaven Hill’s Henry McKenna brand bourbon. Ed and the group had already purchased one barrel, all of which promptly sold out. 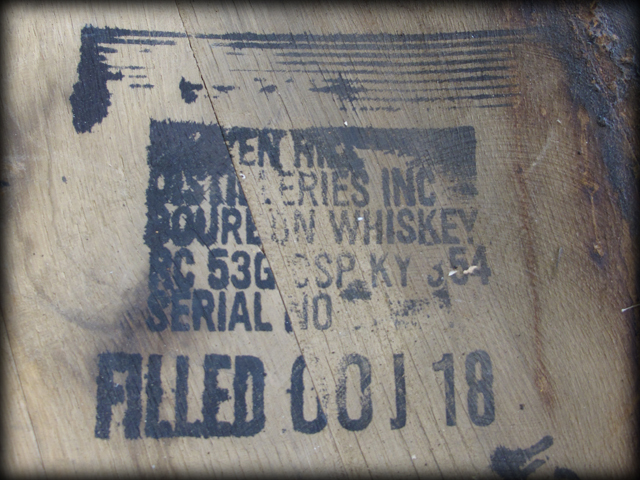 The group was now looking to buy a second barrel, ideally a “sister” of the first which had come from a secondary warehouse some miles from the main Heaven Hill facility. After tasting through this “warm up” flight, we moved on to the main event: six barrel samples of Henry McKenna. These samples had been assigned numbers by our host, #10 – #15, which continued the series the group had evaluated when selecting the first barrel. Since the final product would be delivered at 100-proof, our host had also kindly diluted some of each sample with water, ready to taste. 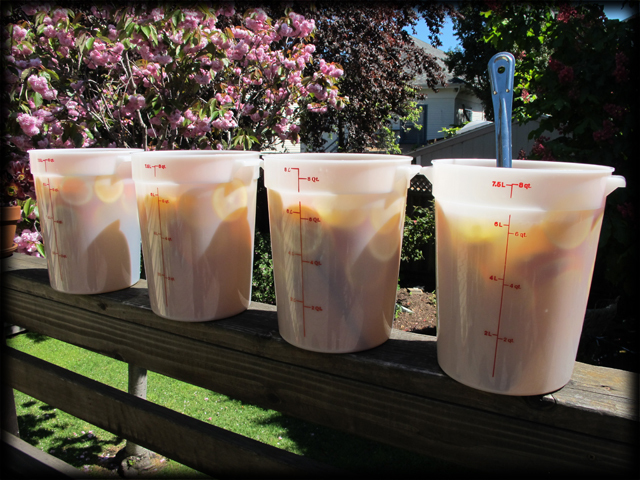 Looking back over my notes, I see that these samples varied quite a bit in terms of nose and flavor, though tea and caramel notes seemed to predominate. 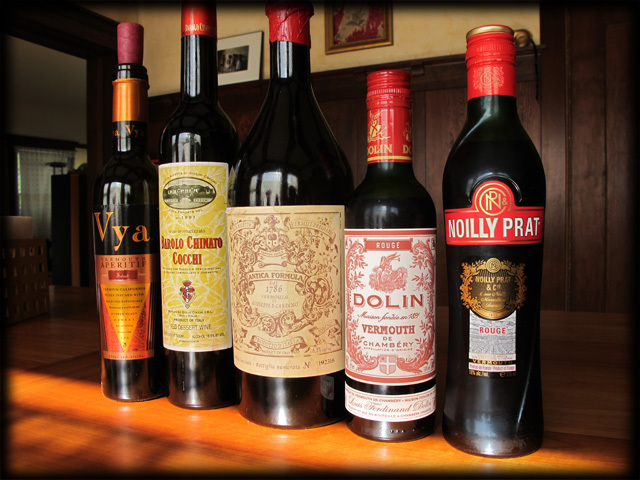 Several also exhibited significant tannins—from the wood of course—but not a lot else to back them up. Discussion was lively but it became clear there was no consensus at the table. Each of us was given the opportunity to “defend” our top choices but in the end, no one was convinced by anything we’d tasted. Everyone felt there had to be a better barrel out there waiting to be discovered. And no one wanted to settle, especially after finding such a great barrel last time. It was at this point that I also started to learn a bit more about the specific provenance of the barrels we were sampling. For starters, while the program that the group was working under was for single barrels of Henry McKenna it sounds as if Heaven Hill was willing to offer barrels from a wide variety sources within the warehouse, meaning they were more likely to be off-profile. (Note: some distilleries earmark barrels for their different brands relatively early in their lives and mange them as such throughout the aging process.) In point of fact, the group made it very clear to me that they are extremely pleased with the relationship they’ve forged with Heaven Hill. The distillery has shown a deep commitment to matching buyers with barrels they really want, not just what they feel they can sell. This hasn’t meant that the distillery hits the bull’s eye right away, but it does mean the group can be confident that they will eventually find something distinctive and worth buying. Though the group had given notes to Heaven Hill requesting samples that matched the profile of the barrel they had previously bought, the distillery wound up sending ones which, while interesting enough, were not on the mark. (One member has characterized them as more like Evan William Single Barrel than McKenna.) It’s hard to know why. I might guess that possibly the notes didn’t get through to the right people or because it was simpler to send samples that had already been pulled. The group would now ask Heaven Hill to send additional samples, please, but might they specifically come from the same section in the Deatsville warehouse where Parker Beam had told them to look last time? The next tasting was held on the evening of the 19th March, structured more or less like the first, though fewer group members were present. We “warmed up” by sampling two newly released whiskeys and comparing them to some other comparable releases from the same distillery (both were from Buffalo Trace). 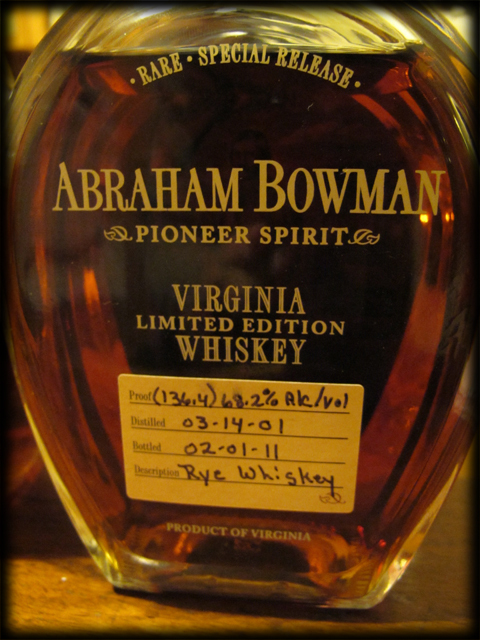 One of these, an Abraham Bowman barrel-strength rye from Virginia, was deemed “a winner” by several of us. It was practically explosive, with spicy orange peel notes and a distinctive viscous mouth feel. It’s also worth mentioning one of the comparison whiskeys: a rare bottling of the “baby” Sazerac rye, which is normally 6 years of age. This bottle, which was purchased as a barrel by Sam’s in Chicago before it closed, held 10 year old product. It was distinctly more refined than the regular bottling. I’d have been happy to drink it along with the Abraham Bowman all night long. However, the group some other more pressing work on its plate. So how about those new McKenna samples? There were three new barrel samples to try, all from the T.W. Samuels warehouse as requested. 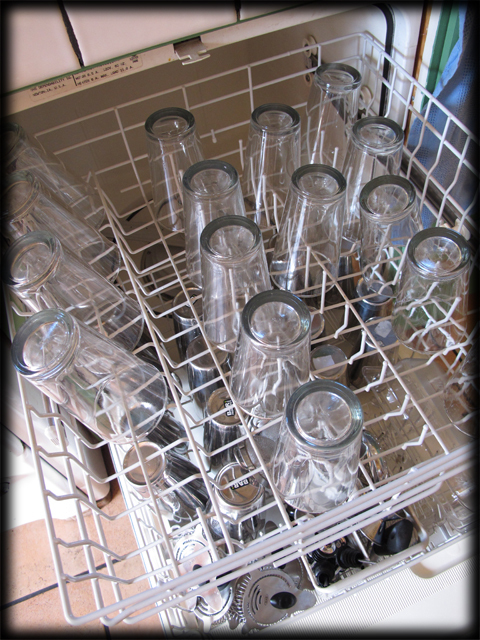 Once again we poured tastes from bottles holding 100-proof dilutions. We also poured tastes of the previously purchased barrel so we had a point of reference. We got right down to serious nosing and tasting. The previous samples, most all of which came from the Bardstown warehouse, had seemed kind of short and ultimately disappointing, especially compared to the barrel that had been purchased a few months back. In stark contrast, the new samples all seemed bold, rich, and easy to love. The first two were notably perfumed and practically floral in the nose. As good as these were, the third sample just blew them away. 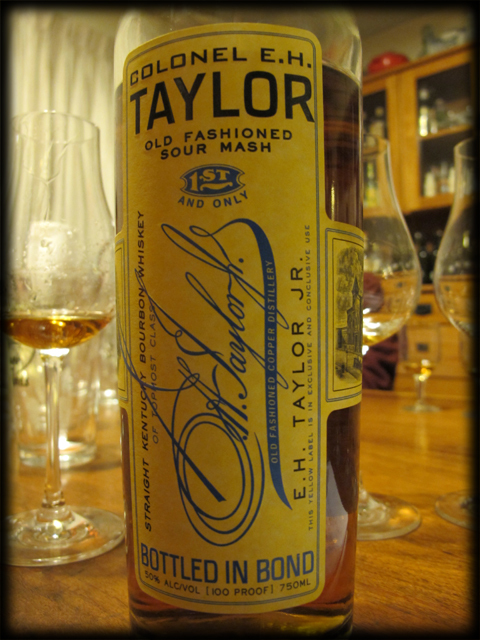 It was rich and spicy with an array of fruit cake notes: candied fruit/peel and a clean grain aroma. You just wanted to keep smelling it. In the mouth it was concentrated and powerful with a long tail finish, a sign of good acidity. The group held opinions back for a few minutes more and then someone finally spoke up: “You know, I’m really loving these whiskeys. What do you all think?” Everyone’s response was the same: “Delicious! I would buy any one of these three barrels!” It was clear the group’s persistence had paid off. There were now three candidates for purchase sitting before the group. The question then became: how to pick one? Someone asks the obvious question at this point: “How would you all rank these?” We go around the table and, incredibly, everyone ranks them same! The third sample (our designation #18, since it was actually the 18th McKenna sample received by the group) was everyone’s favorite. The first sample (#16) was everyone’s second place. The group now knew exactly which barrel they’d be recommending Ed buy, though the final decision would be his after he got a chance to try them on his own. And then I decided to make a bold suggestion: perhaps they should buy both #18 and #16? If, as some group members suspected, these were low fill barrels (as the previous barrel had been), then they’d not be getting much whiskey from them. Rather than risking another fast sell out at the store and another round sampling, having found suitable candidates, why not just purchase two of them now? There was a nodding of heads. The group would be recommending this option to Ed as well. And speaking of Ed: he won’t be sampling these whiskeys until next week some time. We’ll all be curious to know what he thinks and whether he abides by the opinion of the group. I’ll post a follow up to let you all know. I’ll also be sure to let you know when the new whiskey arrives and goes on sale at Ledger’s so you can try it too. PLEASE TAKE NOTE: It will be at least a couple of months from time the barrel is selected till the day it arrives at the store. Please don’t be pestering Ed for bottles now. 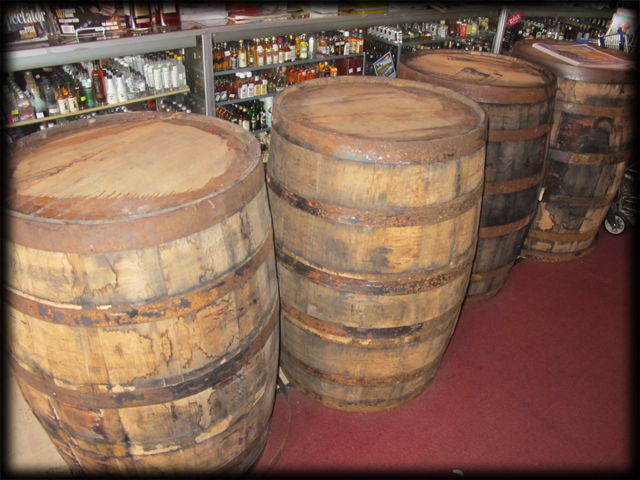 Ed does however have some bottles of his previous Four Roses barrels available for purchase while supplies last.